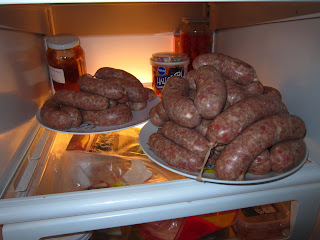 I found a huge pork shoulder and separate package of pork fat in the grocery store the other day, which I took as a sign that I should make a batch of sausages. This time I made breakfast sausages with ginger and sage from the Charcuterie cookbook. I cut up the meat last night and seasoned it. This was made more difficult by the fact that my kitchen scale gave up just as I was almost done weighing out the meat. Really gave out. The display was flashing something unintelligible and continued to do so even after I changed the battery. That makes scaling up a sausage recipe almost impossible! Fortunately, I was very close to being done with the weighing so I guessed on the final amount and then guessed a little on the salt. It turned out a little more salty than expected but not bad, so I seem to have done alright. Today the 11 year old and I stuffed them into casings. My husband took over when said 11 year old got tired. I think we got about 40 links and we had patties for lunch to use up the rest. They taste great by themselves, and awesome with maple syrup. "awesome with maple syrup" - yes! I need to make sausage. Happy new year my friend! And Happy New Year to you! Drop me a line sometime, I'd love to hear what you're up to! These are also awesome over an open fire when you're camping in 14 degree weather. And it's snowing.